Which breed of dog is perfect in size, fur neither too long nor too short, healthy and well-suited to the Indian climate, loving yet independent, friendly, adorable, and intelligent… all at the same time? Well, it is our very own Indian breed, of course! In other words, the common community dog, or pariah, who we see on our streets. 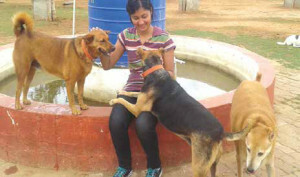 CUPA volunteer Arundathi gets dose to stray love. sterlised, vaccinated, healthy stray pariahs hanging around a CUPA (INSET). The demand for Pedigree dogs has boomed exponentially in India over the past few years. When families decide to add a new furry member to their crew, they contact a breeder for the perfect pup. Most of us would think that it is safe to assume these breeders keep the mother dogs and pups well and take good care of them. However, have you ever given a thought that our Indian pariah can also be a wonderful companion? For every Pedigree pup purchased from a breeder, a perfectly healthy, lovable and equally qualified Indian community dog loses out on a chance to be taken off the streets and into a loving home. Indian dogs are highly appreciated for being sturdy, affectionate, loyal, smart and stronger than their exotic counterparts. There is absolutely no reason to buy a dog and contribute to a dark and cruel industry when you can adopt true love for free! So what is ‘Each One Adopt One’? Do we expect each and every one of you to adopt an Indian dog? The answer is YES! If each family on each street would feed and care for just one stray dog, ensuring that he is sterilised and vaccinated while giving him the freedom to be out as he pleases, that dog is not only perfectly healthy and social but also a guardian for the community. Take a moment to realise that the dog takes care of you too – there are so many instances of incidents wherein evil ploys of burglars and thieves were foiled by an alert and courageous community dog! Sterilisation and vaccination of your dog is a very important component as it benefits all members of the public as much as it ensures animal welfare, and can be done by your local animal rescue organisation for a very nominal donation. The ‘Water Bowl’ project is another initiative by animal lovers in cities all over India that simply encourages people to leave bowls of fresh water outside for stray animals and birds during the scorching summer months. These are small and random acts of kindness that truly have big, positive and immediate impact, also conditioning the community mindset in the long run to be more compassionate and sensitive to all living creatures. Compassion Unlimited Plus Action (CUPA), a Bangalore-based NGO, is championing the implementation of new and strict Breeding Rules under the Prevention of Cruelty to Animals Act 1960, which aims at providing clear legal guidelines to individuals involved in commercial breeding of dogs. These soon-to-be formalised Rules will complement existing Animal Birth Control (Dog) Rules, 2001, which require breeders to register their dogs with the Animal Welfare Board of India (AWBI) and gain permission to breed only after their facilities are inspected. Dog breeders will need to keep a record of all buyers of the pups apart from other stipulated conditions and lack of compliance with the terms and conditions of this Rule will attract severe penalties and even conviction for abuse and exploitation of their dog.